ZeNeRyC Pro 2, Other Virtual Synth from Tekky Synths. 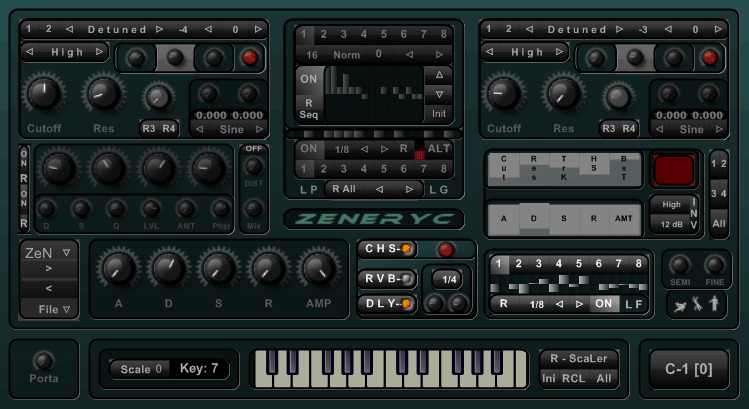 Tekky Synths has updated ZeNeRyC to version 2.0, which integrates a new scaling system developed by Tekky Synths. ScaLer creates scales from inputed keys and enhances the melodic feel for randomized sequences. FIX OSC tuning-Octave shift was offset. FIX Main filter sliders were offset. NEW ScaLer module: Create on-the-fly scales from inputed keys on the virtual keyboard. NEW Density knob for groover random. NEW Default settings when Double-click on knob. NEW Presets (Presets from previous versions might not work anymore). All ZeNeRyC CUST owners will receive ZeNeRyC LIGHT and ZeNeRyC LIGHT updates from now on. NEW ScaLer module: Create on-the-fly scales from inputed keys on the virtual keyboard (Light version). ZeNeRyC Pro 2.0 is available for 65€, the light version is 45€. The upgrade is free of charge for existing customers. 50% Off McDSP Boxed Products Thoughout February, McDSP offers certain of its boxed bundles half priced. Digital DJ Tools Dubby Dubby is a free software virtual instrument for Mac and PC. XILS-lab Le Masque: Delay Music software company XILS-lab announces availability of its first effects plug-in — in collaboration with Le Lotus Bleu (Laurent Bourgeon).